Normally, this series examines a particular game from a particular year, moving forward, decade by decade, but this review, although very much part of the series, is a little different. First, it includes a half decade instead of just whole decades and second, it is not of a particular game, but of a history of a particular game. The game is Magic: The Gathering, the ground-breaking collectible card game from Wizards of the Coast, which in 2018 is twenty-five years old. Just as with Dungeons & Dragons almost twenty years before it, the game’s design and the way in which it was played was unique, creating a format and a type of play that many have tried to emulate, but few have been as successful as Magic: The Gathering. Its theme of rival wizards—known as ‘planeswalkers’—duelling each other using spells which inflict damage on an opponent, provide protection against an opponent, and summon creatures was certainly familiar at the time of its release and remains so today, drawing on the fantasy stylings of Dungeons & Dragons. In 1993, its design and game play were radical, but easy to grasp, with players using card decks they could design and build themselves, then design again after each play to match and tweak a strategy. This was supported by the game being highly expandable, Wizards of the Coast designing and releasing new expansion sets on a regular basis, enabling a player to adjust and redesign his deck or design anew, the result being that it can evolve as the game itself evolves. Lastly, Magic: The Gathering is collectible as well as playable, every card being illustrated with a beautiful piece of artwork and like trading cards, categorised as being rare, uncommon, or common. Magic: The Gathering would win the Origins Awards for Best Fantasy or Science Fiction Board game of 1993 and Best Graphic Presentation of a Board game of 1993 in 1994, with many of its expansions winning Origins awards since then. In the quarter of a century since its first release, Magic: The Gathering has seen many of its players become professional players of the game, made its designers and publishers wealthy, and cemented its place as the definitive collectible or trading card game. The history is Generation Decks: The Unofficial History of Gaming Phenomenon Magic: The Gathering. From its beginnings at the meeting between Richard Garfield and Peter Adkison in 1991, its development and pre-release playtesting to its release at GenCon 1993, and then meteoritic rise in popularity to the establishment of the Pro Tour, the move on-line, and the current state of the game, Generation Decks charts the history of Magic: The Gathering. The game’s early history has, of course, much been written about, but it deserves re-examining and there is a giddy frisson to the book’s opening chapters as the designers, playtesters, and publishers get to grips with Richard Garfield’s unique creation. This almost comes to an abrupt stop with the realisation that the culture at Wizards of the Coast fostered by Peter Adkison is ill-suited to bring Magic: The Gathering to a wider audience and needs to take a mature approach in order to become a professional entity. 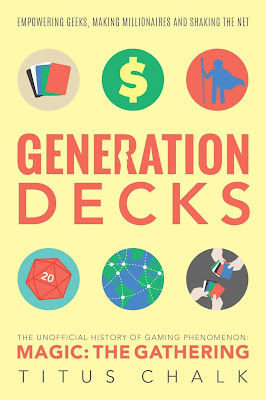 Fortunately, the excitement returns when the book enters the Pro-Tour world and charts the rise of professional players of the game, the author obtaining some excellent interviews with those players who dominated the professional game in its early years, both in terms of their personalities and their deck designs. These include its heroes—Kai Budde and Jon Finkel, and its villains—Mike Long and Mark Justice. Similarly, the rise of hobby is equally as interesting, seeing how players came to engage with the game, whether that is creating safe spaces in which to play, setting up websites where the fans could discuss the game and learn more about it, and so on. Yet, in comparison with earlier chapters which explore the early history of the game in some detail, the later chapters feel hurried and as if they gloss over some of the difficulties that the game and its development has faced as it has moved online and the difficulties of it becoming more than a fad confined to its all too male, all too nerdy community. This highlights an issue with Magic: The Gathering, because for the most part, the history of the game has been a male one and perhaps one of the best chapters in Generation Decks about the current state of the game is the involvement of women in it. Or rather the lack of women in it. This is despite the involvement of women like Lisa Stevens—now the CEO of Paizo Publishing—in bringing Magic: The Gathering to market and beyond, but as Chalk explores, there are relatively few women who actively play the game and even fewer who have succeeded on the Pro Tour. The author takes the time to talk to those who are involved to get their opinions and their experiences. Unfortunately, what this again highlights is that like so many other hobbies, too many men are ill-prepared to accept women into ‘their’ hobby. This is one of the few places in the book where the author is less than positive about the hobby and several suggestions are made as to how Wizards of the Coast and the hobby might overcome this issue and it will be interesting to see if they are implemented and the issue is addressed in a future history. Paralleling the history of Magic: The Gathering in Generation Decks is the story of the author. Notably, he is the son of games designer and illustrator, Gary Chalk, and his story is of a peripatetic upbringing—from the UK to New Zealand, to France, and back to the UK—and of his first encountering Magic: The Gathering to his reengaging with it again and again which parallels the history of the game. Intended to bring a personal touch to the history of the game and certainly, gamers of a similar age will probably recognise some of themselves in the author’s experiences, it is though, very much the book’s ‘B’ plot, not as interesting as the history and downbeat in tone. This personal strand and the history come together at the end of the book when the author gets to meet Richard Garfield himself, and for both author and reader it is an underwhelming experience, cementing the downbeat tone of the personal story with the history. For the most part, this is an interesting and enjoyable read, but not a great read. Generation Decks: The Unofficial History of Gaming Phenomenon Magic: The Gathering might be an ‘Unofficial History’ of the game, but it is more story than history—after all, if it was a history, it would have an index and it would focus less on the author’s own history. Further, it is not quite a hagiography, but it is perhaps too reverent of its subject to be a good history. 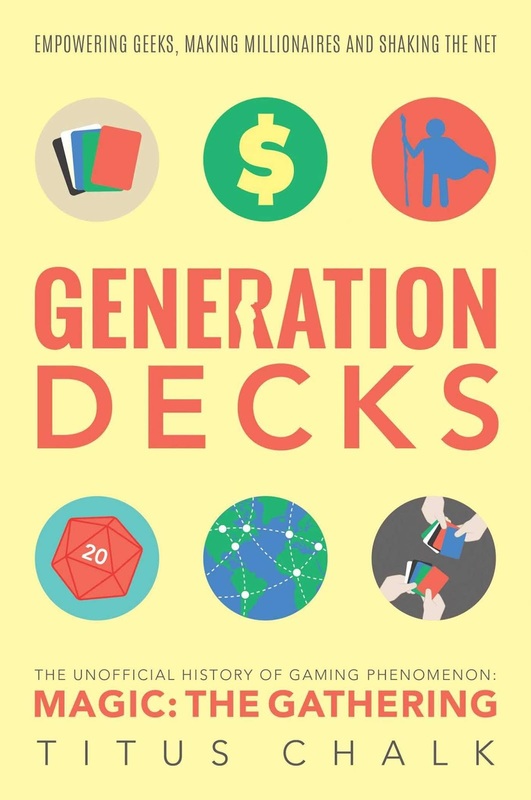 The definitive history of Magic: The Gathering remains to be written, but in the meantime, Generation Decks: The Unofficial History of Gaming Phenomenon Magic: The Gathering is a peripatetic telling of its story.